A LONG sought-after gun belonging to a member of one of Australia's most infamous bushrangers, has been hiding in a Rockhampton home for 112 years. But a private collector has just paid $122,000 for the muzzle-load single-shot pistol, believed to belong to the Kelly Gang's Dan Kelly. Bidding at Charles Leski Auctions in Hawthorn started at $75,000 with six phone bids made, up to the successful bid of $100,000. Auctioneer's commission brought the price to $122,000. For Charles Leski Auctions' Max Williamson, the historical journey to discover the origin of the pistol, has been a career highlight. And it began at The Morning Bulletin. The gun was brought to the auctioneers by a descendant of Rockhampton's Hansen family, claiming the East India Company Cavalry Pistol belonged to Ned Kelly's younger brother. Mr Williamson says the story behind the gun was revealed in an article in The Morning Bulletin on Wednesday October 17, 1900, and re-published in The Northern Miner and the Warwick Examiner and Times. 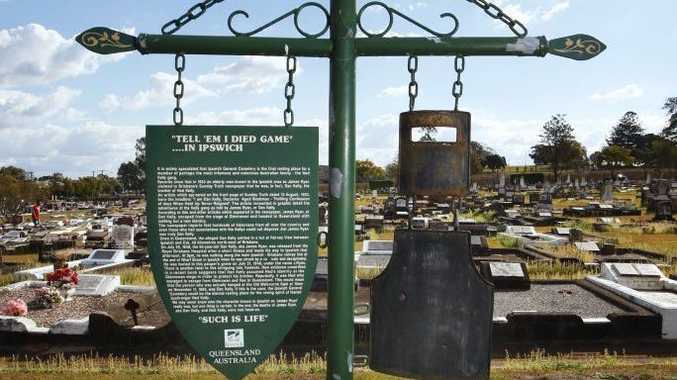 "A memento of the once notorious Kelly Gang was found in Rockhampton recently, in a rather curious way," the article reads. According the article, Rockhampton gunsmith H. P. Hansen bought a lot of "old and rusty firearms" from a townsman. Amongst the firearms was an old horse pistol, about 46 centimetres long. Mr Hansen told The Morning Bulletin at the time, the person he bought the pistol from found it years beforehand on the bank of the Murrumbidgee River. "The stock is of walnut, and the weapon is brass mounted, with a ramrod," reads the newspaper description. "On the stock, where held by the hand, was found cut, apparently with a knife, '1876', and underneath 'Dan Kelly'. "There seems to be no doubt it was at one time owned by one of the Kelly Brothers." Mr Williamson says further research and interviews with noted Kelly Gang historian Ian Jones suggests the Kelly Gang took 17 weapsons to the siege at Glenrowan. "And there's only one that wasn't retrieved," Mr Williamson says. "The pistol was with Dan at the siege of Glenrowan in 1880 where he was killed by police. "I love my job because every so often something like this comes along. "We've sold Phar Lap's saddle, the very first Brownlow Medal, Shirley Strickland's collection, and now this." Mr Williamson says the gun's discovery is not just remarkable because of its rarity and link to one of Australia's most intriguing historical events, but also because it has stayed with the Rockhampton family for so long. "Being a gunsmith, Mr Hansen obviously sold hundreds of guns in his lifetime," Mr Williamson says. "But he obviously treasured this one, kept it and it has been handed through the Hansen family through three or four generations."